FBI and ATF agents responded to a Nogales power plant after a makeshift bomb went off Wednesday. A makeshift bomb exploded at a Nogales, Ariz. power plant Wednesday, rupturing a large fuel tank and prompting the FBI and federal bomb experts to respond. Local officials were alerted at 9:30 a.m. to a call of “suspicious activity” at the UniSource Energy Services Valencia Plant. An explosion had ruptured a diesel storage tank and caused what Nogales Police Lt. Carlos Jimenez described as a relatively small spill that was confined to the immediate area. Officials closed off the power plant and an adjacent car dealership on North Grand Avenue. The FBI, the federal Bureau of Alcohol, Tobacco, Firearms and Explosives and the Arizona Department of Public Safety were called. Agents were still processing the scene at 5 p.m. Wednesday. Arizona Corporation Commission spokesman Rebecca Wilder said there were no power disruptions related to the explosion and the plant sustained only minor damage. “The reason for the high-scale response is the plant is an electrical substation and critical to the area,” Jimenez said, explaining that as many as 30,000 customers in the area – the entire town of Nogales and its environs – depends on the plant for power. “The whole city of Nogales could have been compromised,” he added. There were no reports of injuries and authorities said they knew of no suspects or witnesses. They described the explosive as “a suspicious device,” but would not elaborate. The fuel did not ignite, Jimenez said. Staff Writer Mary Jo Pitzl contributed to this report. 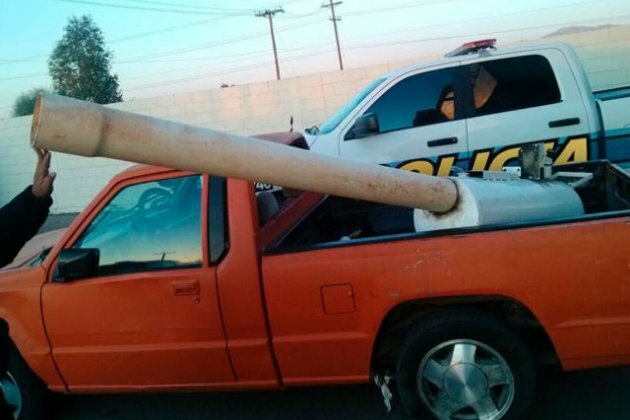 Mexican police have confiscated an improvised cannon that they say was used to fire packages of marijuana across a border fence into California. The makeshift cannon was made of plastic pipe and powered by compressed air sourced from an old car engine, police in the border city of Mexicali said. The device was able to fire cylinders packed with up to 30 pounds of pot. The cannon was discovered on Tuesday after U.S. officers told Mexican police that they had been confiscating a large number of drug packages that appeared to have been fired over the border, the Associated Press said. It’s not the first time drug traffickers have used a cannon to transport marijuana across the border. In December, U.S. Customs and Border Protection officials recovered more than 30 cans of marijuana scattered in Yuma, Ariz., near the Colorado River. In that case, the cannon was not found. But Mexican border police said on Tuesday that they have confiscated similar devices in recent years. AYUTLA, Mexico (AP) — The young man at the roadside checkpoint wept softly behind the red bandanna that masked his face. At his side was a relic revolver, and his feet were shod in the muddy, broken boots of a farmer. Haltingly, he told how his cousin’s body was found in a mass grave with about 40 other victims of a drug gang. Apparently, the cousin had caught a ride with an off-duty soldier and when gunmen stopped the vehicle, they killed everyone on the car. Now he has joined hundreds of other men in the southern Mexico state of Guerrero who have taken up arms to defend their villages against drug gangs, a vigilante movement born of frustration at extortion, killings and kidnappings that local police are unable, or unwilling, to stop. Vigilantes patrol a dozen or more towns in rural Mexico, the unauthorized but often tolerated edge of a growing movement toward armed citizen self-defense squads across the country. “The situation Mexico is experiencing, the crime, is what has given the communities the legitimacy to say, ‘We will assume the tasks that the government has not been able to fulfill,'” said rights activist Roman Hernandez, whose group Tlachinollan has worked with the community forces. The young man and his masked cohorts stop cars at a checkpoint along the two-lane highway that runs past mango and palm trees to Ayutla, a dusty, sun-struck town of concrete homes with red-tile roofs. Pigs, chickens and skinny dogs root in the dirt while the mountains of the Pacific Coast range loom above. The men wear fading t-shirts, leather sandals and most are armed with old hunting rifles or ancient 20-gauge shotguns hanging from their shoulders on twine slings as they stop cars and check the IDs of passing drivers. The reach of drug gangs based in Acapulco, about 45 miles (75 kilometers) away, had intensified to the point that they were demanding protection payments from almost anybody with any property: truck and bus drivers, cattle ranchers, store owners. In a region where farmworkers make less than $6 per day, the situation grew intolerable for everyone. “When they extorted money from the rancher, he raised the price of beef, and the store owner raised the price of tortillas,” said a short, stocky defense-patrol commander who wore a brown ski mask and a black leather jacket. Because the patrols are not formally recognized by the courts, the law or the government — and they fear drug cartel reprisals — most members wear masks and refuse to give their full names. An example of the danger came in late July when the city’s official police chief was found shot to death on the edge of town. It was another attack by criminals that sparked the movement in Ayutla: In early January, gang members kidnapped a commander of an existing community police force in a nearby town. “Maybe they wanted to intimidate us, but it backfired. They just awakened the people,” said one of the older vigilantes, a straw-hatted man without a gun. Since then, the upstart self-defense movement has spread to other towns and villages such as Las Mesas and El Pericon. On a recent day, Associated Press journalists saw 200 to 300 masked, armed men patrolling, manning checkpoints and moving around in squad-size contingents. Some had only machetes, but most had old single-shot, bolt-action rifles. Waving guns, they stop each vehicle, and ask for driver’s licenses or voter IDs, which they check against a handwritten list of “los malos,” or “the bad guys.” They sometimes search vehicles and frisk the drivers. The movement so far seems to be well-accepted by local residents fed up with crime that plagued this stretch of mountain highway. One vigilante passed sheepishly down the line of waiting cars with a jar asking for donations. Some people tossed in coins or small bills. Housewife Audifa Miranda Arismendi showed up at the vigilante checkpoint in El Pericon with a vat of chilate, a local beverage made of rice, cocoa beans and cinnamon, for the masked men. “It’s good to help out here, because this is for the good of all,” she said. Some officials, too, have cautiously approved of the do-it-yourself police. Guerrero Gov. Angel Aguirre offered to supply them with uniforms so they wouldn’t be confused with masked gang members, but he also said he is trying to eliminate the need for vigilantes by beefing up official forces. Community and indigenous rights activists often see citizen patrols as a good alternative or addition to standard rural police forces that are considered corrupt or repressive. But clearly, the vigilante squads here present problems even in their first few weeks. The vigilantes in Guerrero are holding, by their own account, 44 people accused of crimes ranging from homicide to theft. Nobody outside the village of El Zapote, where they are being held in a makeshift jail, knows what conditions they are being held in, or what charges, if any, there are against them. When the head of the Guerrero state Human Rights Commission, Juan Alarcon Hernandez, showed up to check on the prisoners’ condition, he was met by about 100 angry villagers who said they didn’t want anyone to visit the prisoners. “No, no, no. We want justice!” the crowd shouted. “We wanted to see what condition these people are in, as a human rights issue and as a humanitarian issue,” said Alarcon Hernandez. Eventually, he and his aides turned around and left, unsure how to proceed, because the self-defense squads exist in legal limbo. Still, the idea of citizen patrols is spreading in Mexico. In 2011, townsfolk in the pine-covered-hill town of Cheran in neighboring Michoacan state began armed patrols in the face of what they said were the killings of farmers by illegal loggers in league with drug traffickers. In the northern state of Chihuahua, a community of farmers and ranchers known as Colonia Lebaron — most of whom hold dual U.S. citizenship — set up self-defense squads following the 2009 killings of two of its members. And in the drug-plagued northern state of Sinaloa, the mayor of Concordia, Jose Elijio Medina, responded to a massacre, which forced everyone in a remote hamlet to flee, by calling for the Mexican army to revive the Rural Self Defense Corps, units of armed farmers it once helped train and supervise. While the army did not respond to requests to say how many of the units remain, local media have reported the army has been trying to wind down the few remaining units. Since 1995, about 80 villages in Guerrero state have organized legal “community police” forces in which poorly armed villagers detain and prosecute people. With their own jails, “courts” — actually village assemblies that can hand down verdicts — and punishments that can include forced labor for the town or re-education talks, the community police are recognized by state law, though rights activist Hernandez said there is still friction when community rules intersect with the formal legal system. He pointed to one incident in 2012 where a judge and a detective in the Guerrero town of San Luis Acatlan arrested a community police leader for exceeding his authority. Villagers responded by arresting the judge, the detective and an assistant. Members of the vigilante squads in Guerrero say what they want from the government is some kind of salary, not modern weapons. What counts, they say, are their ties to the community and resistance to corruption. A trio of Republican senators said this week they’re willing to move forward on a comprehensive immigration reform plan that may include a path to citizenship for the estimated 11 million undocumented immigrants in America, providing further evidence that Republicans’ poor showing among Hispanic-Americans in last week’s election has forced the GOP into a more accommodating stance in the immigration reform debate. The Hill newspaper reports Sens. John McCain, R-Ariz., and Orrin Hatch, R-Utah, two seasoned veterans of past immigration reform battles, were joined by relative newcomer Sen. Marco Rubio, R-Fla., a Hispanic lawmaker who could bridge the divide between immigration reform advocates and the conservative wing of the GOP that has fiercely opposed past reform efforts. The GOP’s role in scuttling past immigration reform efforts (and their tenor in doing so) was widely blamed for Republicans’ poor showing among Hispanic-Americans in last week’s election. GOP presidential nominee Mitt Romney lost the Hispanic vote almost three to one, and many analysts have recognized the electoral peril in continuing to dramatically underperform among the largest ethnic minority in America, warning that the GOP may become a permanent minority party if it is seen as the refuge of nativists. And it’s apparently not just Hispanic-Americans who want comprehensive reform: in a Washington Post/ABC News poll released Wednesday, a clear majority of Americans – 57 percent – support a path to citizenship for undocumented immigrants as part of an immigration reform bill. Only 39 percent of respondents opposed the proposal. Both McCain and Hatch have something of a tortured history on immigration reform. McCain co-sponsored a comprehensive immigration bill with the late Sen. Edward Kennedy, D-Mass., in 2005, but was forced to disavow his involvement during the 2008 Republican primary and embrace an enforcement-first approach, telling a skeptical Republican base, “I got the message, we’re going to secure the borders.” He further distanced himself from his past support for immigration reform in the face of a stronger-than-expected primary challenge from former congressman J.D. Hayworth during his 2010 Senate reelection bid. Hatch, for his part, was an original co-sponsor of the DREAM Act that would confer citizenship to children of undocumented immigrants who agreed to serve in the military or pursue higher education, but he too was forced to wash his hands of past apostasy to survive a primary challenge earlier this year. Rubio, who may be the most important player to watch given his popularity among the conservative base, began work on a Republican alternative to the DREAM Act last year but abandoned his efforts after President Obama sapped his momentum with an executive order granting visas to some undocumented immigrants brought here as children. Despite that false start, some Republicans are hoping that Rubio’s credibility with conservatives will provide cover for other lawmakers to play ball without fear of a mutiny on their right flank. On Thursday, police in Phoenix arrested Carlos Noe Flores, 35, after he reportedly shot another drug trafficker. On September 22, Flores and the victim met another pair of men who were supposed to purchase 20 pounds of marijuana, according to police. However, the two were robbed at gunpoint of the drugs. Two days later, apparently suspicious that his partner had set-up the robbery, Flores told the man that he was going to kill him as the two traveled north on Mesa Drive. The victim jumped from the vehicle, but as he did, Flores shot him once in the side. When police took Flores into custody, he told them that his boss, another cartel member had ordered the murder. Flores has been charged with first-degree attempted murder and is currently being held in the Maricopa County Jail. The case is just another example of how the Mexican drug cartels now operate freely on this side of the border. On April 11, 2008, the U.S. Justice Department’s National Drug Intelligence Center released a situation report, illustrating just how widespread the activities of Mexican drug cartels have become throughout the U.S.
“Mexican DTO’s (Drug Trafficking Organizations) are the most pervasive organizational threat to the United States. They are active in every region of the country and dominate the illicit drug trade in every area except the Northeast. According to the 2008 report, Mexican drug traffickers were operating in 195 U.S. cities. In 129 of those cities, law enforcement determined that those traffickers were directly affiliated with one or more of the four major Mexican drug cartels. The Justice Department report identified 82 U.S. cities with trafficking operations directed by the Federation (Sinaloa) Cartel; 43 cities with operations being directed by the Gulf Cartel; 44 cities with operations being directed by the Juarez Cartel; and finally, operations in 20 cities under the control of the Tijuana Cartel. By Spring of 2009, the cartels were operating in 231 U.S. cities. Only two years later, the same report claimed the cartels were distributing drugs in “more than a thousand” U.S. cities. Both the Sinaloa and Juarez Cartels operate directly in Phoenix, according to the FBI. Since October, the Bureau of Land Management has expanded its operations at two national monuments in southern Arizona, trying to crack down on smugglers and illegal immigrants who trample and trash the pristine desert on their way north from Mexico. The federal agency has brought in more than a dozen law-enforcement rangers from other states to beef up patrols at the Sonoran Desert National Monument, south of Phoenix, where towering saguaro cactuses, wide-open valleys and flat-topped mountains create one of the most iconic vistas in the Sonoran Desert. The operations also have focused on the Ironwood Forest National Monument north of Tucson. Because of their remote locations and ample hiding places, the monuments have become superhighways for violent smugglers sneaking drugs and illegal immigrants from the Mexican border into Arizona. The smugglers have cast off acres of trash and created miles of illegal roads by plowing through the desert with disregard for the fragile vegetation, often using stolen vehicles that are driven until they break down and are abandoned, authorities say. During seven two-week operations, the agency’s rangers have seized more than 27,000 pounds of marijuana and arrested more than 1,200 illegal immigrants, according to the BLM. That is in addition to the thousands of pounds of drugs and thousands of illegal immigrants arrested by law-enforcement authorities. The agency also has removed 60 abandoned vehicles, 110 bicycles and more than 24 tons of trash, enough to fill 1,239 garbage bags. And the agency has covered up more than 15 miles of illegal roads. But some of the agency’s work to protect the pristine desert areas from smuggling activity has caused concern among conservation groups. Last year, the agency began erecting long vehicle barriers made of welded scrap-steel railroad tracks to block smugglers from driving vehicles through wilderness areas inside the Sonoran Desert National Monument. The barriers have been highly effective, BLM officials say. Not a single smuggler has driven into wilderness areas where the barriers have been installed, they say. Conservation groups say the barriers, although effective, also mar the landscape. However, they view the barriers as the lesser of two evils. In 2000, President Bill Clinton created the Sonoran Desert and Ironwood Forest national monuments to protect them from urban sprawl extending south from Phoenix and north from Tucson. The 487,000-acre Sonoran Desert National Monument is located between Gila Bend and Casa Grande, off Interstate 8. The area is the most biologically diverse desert in North America and is known for its abundant forests of saguaros interspersed with paloverde trees, creosote bushes, sage and ironwood trees. The area also contains many archaeological and historic sites, including remnants of villages that once belonged to the ancestors of the Tohono O’Odham, Quechan, Maricopa and other Native American tribes. The smaller Ironwood Forest National Monument encompasses 129,000 acres of desert west of Interstate 10 and north of Tucson. The area is known for its concentration of ironwood trees, some more than 800 years old, and its collection of more than 200 ancient Hohokam sites. The Sonoran Desert National Monument includes the Vekol Valley, where one man was killed and another wounded in April 2011 during a shooting involving drug smugglers. The smugglers have carved foot trails that spider through the desert and have left behind acres of plastic water bottles, coats, backpacks and other items cast off after trekking for days from the U.S.-Mexican border to rendezvous points 75 miles to the north along I-8, the main highway smugglers use to transport drugs and illegal immigrants to stash houses in the Phoenix area or to California. During a tour of the Sonoran Desert National Monument one recent afternoon, Jon Young, the BLM’s chief ranger in Arizona, pulled his pickup truck off I-8 and stopped next to Mile Marker 157. He told his passengers to wait in the truck while he got out to make sure there weren’t any drug smugglers hiding in the brush. Young poked around in the brush for a few moments and then gave a thumbs up. The ground was littered with fresh signs of smuggling activity. Young picked up a boot made of carpeting used by smugglers to conceal their footprints. Strewn nearby were several burlap sacks, remnants of homemade backpacks used for hauling marijuana through the desert. There were also several mud-caked jackets and lots of empty half-gallon plastic water bottles, colored black to make them less conspicuous in the sunlight. Young pointed to the ground beneath the bushes, which had been matted down from the weight of smugglers. A well-worn path leading south toward the border also was clearly visible. Young said smugglers typically hike four or five days through the desert with backpacks loaded with about 45 pounds of marijuana. They usually travel in groups of 10 to 15 but sometimes break into smaller groups. They also are typically accompanied by a scout who, instead of drugs, carries a backpack full of food, water, radios and cellphones, Young said. Depending on how far the group is traveling, the smugglers may have several support people hiking with heavy packs full of food and extra water, he said. Once they reach I-8, they hide until other members of the smuggling organization arrive to pick up their loads of drugs. The marijuana is then loaded into pickup trucks and driven to stash houses in nearby towns or the Phoenix area, Young said. Smuggling has become so prevalent, the BLM has posted signs on roads leading into the monuments that warn the few remaining visitors to travel with caution. The agency doesn’t track visitors, but rangers and conservation groups have seen a decline in the number of hikers and campers who use the monuments, and many now carry guns for protection. “Smuggling and illegal immigration may be encountered in this area,” the signs say. During operations at the monuments, the BLM transfers about 12 to 16 rangers from other states to Arizona. They work with the 10 rangers assigned to the BLM’s Phoenix district, which manages the Sonoran Desert monument, and 12 rangers assigned to the BLM’s Gila district, which oversees the Ironwood monument. To combat smuggling inside the two monuments, the BLM rangers work with other law-enforcement officers who are part of the Alliance to Combat Transnational Threats, a group of law-enforcement agencies that includes the Border Patrol, Immigration and Customs Enforcement, and the Pinal County and Maricopa County sheriff’s offices. The most recent operation ended last week, resulting in the collection of 219 bags of trash, the seizure of 6,000 pounds of marijuana and the discovery of the body of one migrant. On a recent Saturday, Joe Nardinger, 38, a BLM ranger from the Upper Missouri Breaks National Monument in Montana, found 46 bundles of marijuana weighing 1,000 pounds while patrolling a wash on the Sonoran Desert National Monument. Nardinger, who was sent to Arizona for two weeks, had been following some fresh tire tracks when he found the marijuana. It was hidden in the bank of the wash, covered by branches the smugglers had cut from nearby paloverde and mesquite trees. “I smelled it before I saw it. I got a whiff, a big dose of it,” Nardinger said. In addition to beefed up patrols, the BLM has been cleaning up trash and getting rid of illegal roads and foot trails created by smugglers. Despite the efforts, drug smuggling continues to increase in the area, although illegal-immigrant traffic is down, Young said. Their cleanup and restoration work has been applauded by conservation groups. But conservationists are less enthusiastic about the vehicle barriers the BLM has been installing inside the Sonoran Desert National Monument. Last fall, the BLM erected 1.3 miles of vehicle barriers at the southern end of the Sonoran monument abutting the border of the Tohono O’odham Reservation. They were intended to prevent smugglers from driving north from the reservation through the heart of the monument’s designated wilderness area. Last week, the agency finished erecting about a quarter-mile of vehicle barriers northwest of the Table Top Mountain Range. Those barriers are designed to prevent smugglers from driving south from I-8 to rendezvous points inside the monument. The BLM plans to install more barriers in other parts of the Sonoran monument, Young said. Known as Normandy barriers, after the coastal barriers used in Nazi-occupied France during World War II, the 2-foot-high barriers have proved effective in preventing smugglers from driving through wilderness areas and creating illegal roads,Young said. The Border Patrol has installed miles of barriers along the Arizona border with Mexico. But this is the first time Normandy barriers have been used away from the border, said Matt Skroch, executive director of the Arizona Wilderness Coalition, a conservation group. The barriers mar the landscape, and conservationists are concerned that those being used inside the Sonoran monument will open the door to more in other pristine desert areas throughout the state, Skroch said. “We certainly don’t want to see a scenario where we keep installing more and more vehicle barriers,” he said. But the group isn’t opposed to the barriers outright, Skroch said, because so far, they have been effective in stopping smugglers from creating roads and destroying more of the desert landscape. “This is the lesser of two evils,” Skroch said. Fighting drugs and border violence at Arizona’s Organ Pipe Cactus National Monument: What about the ranger’s M14 rifle, Yogi? 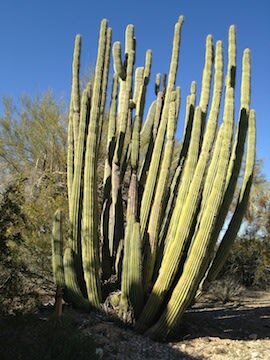 ORGAN PIPE CACTUS NATIONAL MONUMENT, Ariz. — On a hot desert morning last week, a group of 20 tourists gathered in the visitor center in Arizona’s Organ Pipe Cactus National Monument to attend a mandatory safety briefing before taking a guarded van tour to Quitobaquito springs. The springs is part of the 69 percent of the remote border park west of Tucson that has been closed to the public since Kris Eggle, a 28-year-old law enforcement park ranger, was shot and killed while pursuing drug runners armed with AK-47s in 2002. Organ Pipe was named “the most dangerous national park” that year and also in 2003 by the U.S. Park Rangers Lodge of the Fraternal Order of Police, before the group discontinued the series. The drastic increase of drug activity on Arizona’s southern border since the 1990s has turned Organ Pipe rangers into de factor Border Patrol agents, and spurred state lawmakers to pass several laws cracking down on illegal immigrants within the state. Since 2009, the park has offered van tours to the springs, as long as rangers armed with assault rifles go along to protect the visitors. Now, ten years after Eggle’s murder, the park’s leadership has decided to open up a portion of the closed areas to the public in March, citing improved safety conditions and a big increase in Border Patrol agents in the area. In the run-up to Tuesday’s Republican presidential primary in Arizona, immigration has once again been a hotly contested topic in the state: Mitt Romney in a debate last week praised Arizona’s immigration laws as a “model” for the country, while President Obama’s Justice Department is suing Arizona to overturn one of those laws, called SB1070. The law–which has not gone into effect because of a federal court order–requires police to check a person’s immigration status during stops if there is a “reasonable suspicion” that someone is in the country illegally. It also makes it a state crime to fail to carry immigration papers or for illegal immigrants to solicit work. Drug violence has claimed tens of thousands of lives in Mexico since President Felipe Calderon declared war on the cartels in 2006, but spillover violence has so far been minimal in the United States. Still, Jan Brewer, the Republican governor of Arizona, falsely claimed that beheadings occurred in the Arizona desert in 2010, the same year she signed SB1070 into law. Arizona was also the first state to pass a mandatory E-Verify law in 2007, to ensure employers don’t hire illegal immigrants. Brewer says the law will help police officers combat drug trafficking and crime, but critics say it will encourage racial profiling and interferes with federal control over immigration. Yahoo News went to Organ Pipe last week to witness the challenges of the border as the presidential candidates debate how best to control it. “There is a chance we might have to cancel the tour if there’s some sort of apprehension in progress,” Park Ranger Karl Sommerhauser, wearing a bulky dark green bulletproof vest, told the tourists last week. Sommerhauser had an ear piece curling out of his left ear. “We expect you to take direction from Ken,” he said sternly. “You say there was an incident out there?” a walrus-mustachioed passenger wearing a cowboy hat asked warily. “We’re it,” Ken said, to nervous laughter. Organ Pipe Cactus National Monument, a 330,000-acre, surprisingly green stretch of Sonoran desert populated by barrel, saguaro and organ pipe cacti, spans 30 miles of the U.S.-Mexico border. The park became a corridor for drug runners in the 1990s after border security tightened at major ports of entry and in urban areas, driving human and drug traffickers to rural crossings. Alan Bersin, the Customs and Border Protection commissioner until last year, admitted that the Tucson sector of the border was “out of control” until recently. In 2010, half of all border apprehensions and drug seizures occurred in the Tucson sector, which encompasses much of Organ Pipe. Drug runners would cut across Mexican Highway 2 through Organ Pipe’s dirt roads in a car and then quickly hop onto U.S. Highway 85, which shoots up to Phoenix or Tucson. The vehicles blazed more than 200 miles of unauthorized roads through the park, and rangers found themselves in dangerous, high-speed chases nearly every day. An $18 million, 23-mile vehicle fence put up after Eggle’s murder by the Department of the Interior cut down on this vehicle traffic. Now, cartels have had to get smarter, sometimes cutting into the fence, removing it, driving through, and then putting it back together again. Drug runners also started coming more on foot, dropping their packages in designated spots on the highway for someone else to pick up. The Department of Homeland Security recently put up nine surveillance towers in the park, making it easier for agents to detect this new foot traffic, so the drug runners are now hiding in the hills, where the towers can’t see them. (A Border Patrol helicopter operation last year in these hills netted 800 pounds of trash and a whole “herd” of people, according to Hires.) Border Patrol set up a check point on Highway 85 within the park in the past year, which has pushed drug traffickers to the neighboring Cabeza Prieta National Wildlife Refuge and Tohono O’odham reservation, adding as much as four days to their on-foot journeys. “They’re very adaptive, more so than us,” said Organ Pipe park superintendent Lee Baiza wearily, during an interview with Yahoo News last week. Baiza said he spends about 80 percent of his time working with Homeland Security and handling border concerns. “There’s nothing normal about Organ Pipe,” he added. The superintendent, who took over in 2007, has faced criticism for preventing Border Patrol agents from building new roads in the wilderness areas of the park, which is part of a larger struggle between Homeland Security and national park and land agencies that operate on the border. (More than 85 percent of border property in Arizona is federally owned.) Bob Bishop, a Republican representative from Utah, introduced a bill last year that would waive environmental laws up to 100 miles north of the border, freeing up Homeland Security to build roads through the wilderness to combat illegal immigration and drug running. Bishop criticized the U.S. Fish & Wildlife Service for preventing Border Patrol agents from driving off-road in the Quitobaquito area of the park because of a pond nearby that contains the endangered Sonoran desert pupfish. “I may care about the pupfish, but I also care about kids getting hooked on illegal drugs that are coming over that border,” Bishop told Yahoo News. Drug runners cause more environmental damage to the border by leaving trash, he said, than Border Patrol agents would by building roads. Apprehensions in the park were down last month for the first time in three years, Baiza said. Border Patrol would not release park-specific data, but a spokesman, Jason Rheinfrank, said that the Tucson sector overall saw a 40 percent drop in apprehensions last fiscal year, while the number of agents has nearly tripled since 2000. Illegal crossing arrests over the entire border were at a four-decade low last fiscal year, in part because of the flagging American economy. On March 1, 46 percent of the park–instead of 31 percent–is scheduled to be open to the public. Baiza cited the increased fencing, number of Border Patrol agents, and technology in the park as the reasons for the change. “The real problem we have with safety is drug dealing, not the people looking for work,” Hires said from a loudspeaker system at the front of the van. Three different border patrol agents riding ATVs raced by, waving. “What we are trying to do is retake this landscape so we can all be free to be out here,” he added. Twenty minutes later, the vans arrived at Quitobaquito, where two young men toting heavy M14 rifles were already waiting. The rangers arrived at the springs two hours earlier to scour the area and make sure no one was hiding. “Please be respectful and don’t photograph them,” Hires warned. The park service is worried that cartel members would retaliate against the rangers if their faces were publicized. Baiza says Organ Pipe never sends out press releases announcing new ranger hires for the same reason. The armed park rangers didn’t greet the group and stayed about 20 paces ahead on the trail. Hires showed the tourists the endangered Sonoran desert pupfish in the pond (the endangered Sonoran mud turtles were nowhere to be found), and answered questions about the names of different plants and flowers. He explained that the springs has been a crossroads for thousands of years, an oasis drawing thirsty desert-dwellers and entrepreneurial shell traders. The tour ended, and two volunteer rangers stood guard as visitors used the restroom in the bushes before the long van ride back. “You got to show me your visa,” one volunteer ranger joked as people began loading back into the van. On the way out, Hires pointed out the two park rangers at the top of the hill, green specks on the horizon. Another border patrol ATV zoomed past the van and stopped the law enforcement park rangers who were escorting the group back to the visitor center. Two brown packages were tied to the back of the ATV. “See those bundles? Want to guess?” Hires asked. “Marijuana.” In 2005, the last year the park released border incident data, Organ Pipe park rangers seized 17,000 pounds of marijuana. The rangers let out a dog from the back of the SUV, as the visitors craned their necks to watch from the van. The dog jumped out and ran to the bundles. He sat down abruptly and pointed his nose at the packages, then looked back at his masters. “That’s the sign,” Hires said. The rangers tossed the jubilant dog a toy, and the Border Patrol agent drove off again in the ATV. Despite all the excitement on the trip, Hires said he thinks the park is very safe because of the law enforcement rangers and the Border Patrol agents. But visitors–or rather, the people who are choosing not to be visitors–still have concerns. In 2010, visits to the park plunged to a 10-year low of 209,600. Baiza says that when state politicians focus on the dangers of Mexico and the border, fewer people visit the park.